Also called a “knuckle” boom, this type of lift uses a bucket on a swiveling turntable at the end of an articulating arm. The unique design provides vertical and horizontal flexibility, making the knuckle boom useful for many types of jobs. Articulating booms have a max vertical reach of 125 feet. They can extend horizontally to 75% of the height. The boom can also be extended in sections. This allows workers to maneuver up and over obstacles. Articulating booms are good for hard-to-reach areas and wide work areas that require an extra reach. Articulating booms can be used for indoor and outdoor jobs. Indoor models tend to be smaller than outdoor models, and are electrically powered. Outdoor knuckle booms are usually diesel-powered or can be towed to a work site. When using them on unfinished terrain, it is advised to use rough terrain tires or treads. 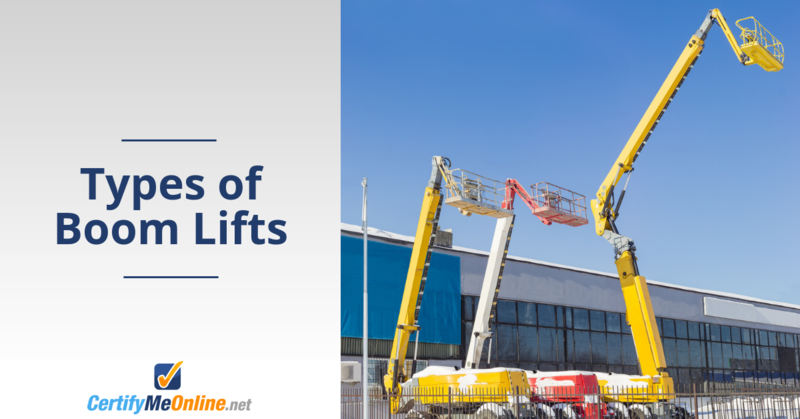 These lifts provide more vertical height than other boom lifts. Like the knuckle lift, they have a bucket situated on the end of a telescopic arm. However, the arm can only extend in a straight line. During use, the arm goes straight out horizontally, then goes up and down as needed. Because the arm can only move in one direction, telescopic booms are sometimes called “stick” booms. Designed for jobs in very high workspaces, telescopic booms provide platform heights of 40 to 80 feet. However, the biggest models can reach up to 185 feet in vertical height. This makes them ideal for construction and other types of industrial projects. To support working safely at such heights, telescoping booms tend to have wider bases than articulating lifts. The tallest jobs need to accommodate base widths of up to 10 feet. Rough terrain telescoping booms that use stabilization require an even bigger work surface. However, because they have a single boom, telescoping booms are easier to operate than articulating booms. Atrium lifts are a special type of articulated boom lift. Unlike other articulated booms, they don’t have wheels. Instead, they use tracks (like those on excavators) for mobility. This allows atrium lifts to safely navigate different types of terrains. Atrium lifts are narrower and lighter than other boom lifts. This lets them reach maximum heights of up to 60 feet in small areas. Atrium lifts use folding outriggers to keep them anchored in place during use. They can also handle heavy loads for their size. The low ground pressure of atrium lifts allows them to be used inside as well as outside. The chassis disperses the lift’s weight over a wider area so it can safely be used on lawns, pavements, marble and other sensitive surfaces. Atrium lifts can be deployed in tight areas and where steep surface inclines make it unsafe to use self-propelled or scissor booms. Job site terrain. Are you indoors or outdoors? Is the terrain smooth and level, or bumpy and inclined? Access to the job. Is the work site easily accessible or hard to reach? Will you be working head-on, overhead or underneath? Mobility. Will the job require both horizontal and vertical mobility? Or, do you only need to go straight up and down. Work requirements. How many people will need to be on the platform? What kind of tools and equipment will the job require? Getting to the job site. Do you need a boom lift that can transport itself to the job site? Or, will the location and job conditions require a towable lift? Weight considerations. How much weight will you need to lift? How much weight can the job surface support? For example, atrium lifts weigh less than others and can be used on second stories and other weight-sensitive surfaces. One factor that often gets overlooked is the lift’s footprint during work and when stowed. Atrium lifts have a narrow base, but the outriggers used to stabilize the lift create a much bigger footprint when in operation. However, the smaller footprint when stowed makes it possible to navigate through most standard doors before setting it up. Regardless of which type of boom lift you use, be sure to train and certify each operator on the specific model in use for complete safety.